If backroads have backroads, this is it. 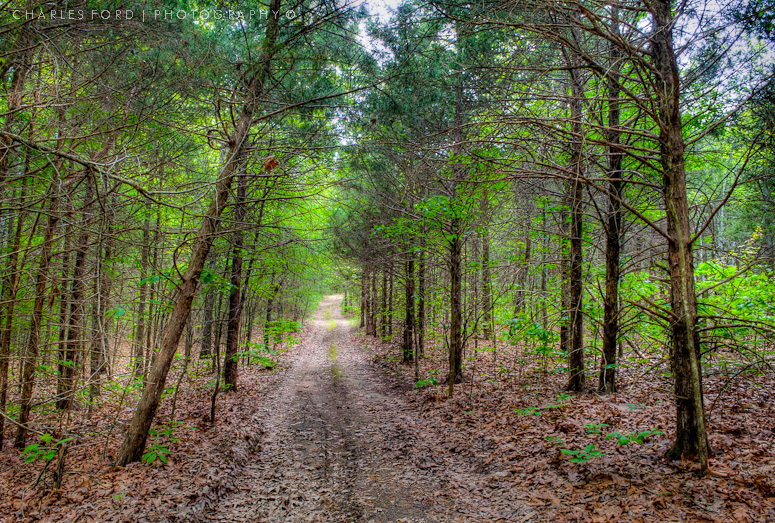 Deep in the trees near Table Rock lake in the Missouri Ozarks, this road loops around an area of forest before returning to the ‘main’ backroad. This is an HDR taken last Saturday, as I visited my brother and nephew. Did you ever make a photo that looks really good when viewed at a large size, but where the WOW factor seems to plummet rapidly as the size shrinks just a little? That’s what I’m thinking here, and it is a mystery to me. We have had a lot of fun over the years along this road, so I’m glad to have a good image to remember it by. 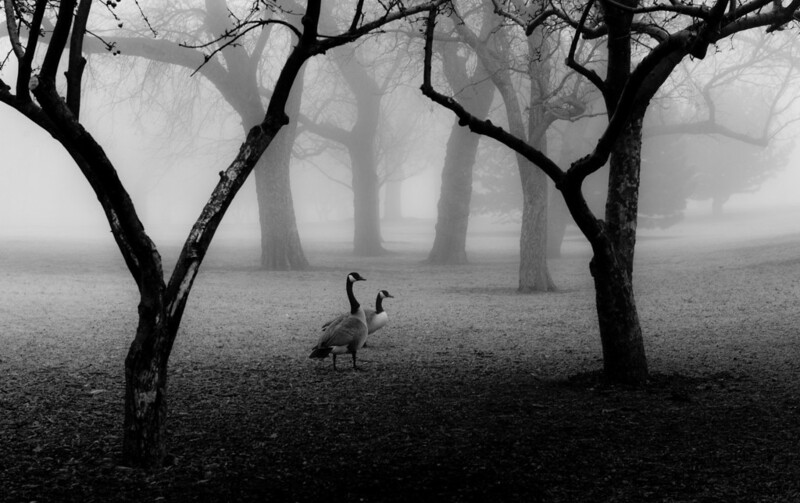 I had an image from my foggy morning photo session awhile back that I never quite knew what to do with. 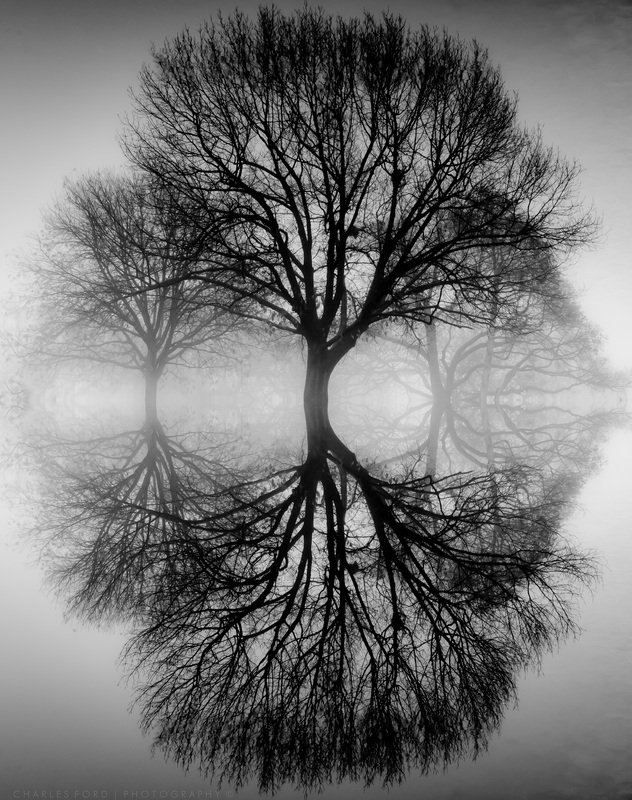 It was the reflection of trees in a mirror smooth pond. It occurred to me that I could try something along the lines I remember Ken Bello doing on his blog , a mirror image. A reflected view of the reflection, on top of the reflection. That’s not confusing at all! Sometimes I think this pursuit of photography is all done with smoke and mirrors anyway, I suppose this is my tribute to that concept. I was trying to think a little more outside-the-box creatively on this one. A little less conventional you might say. It would be hard for me to understate how exciting it was to photograph in this dense fog, which is a fairly unusual happening in my hometown. The ethereal quality the fog imparts to otherwise ordinary scenes was remarkable. The stable lighting allows one to concentrate on composition. 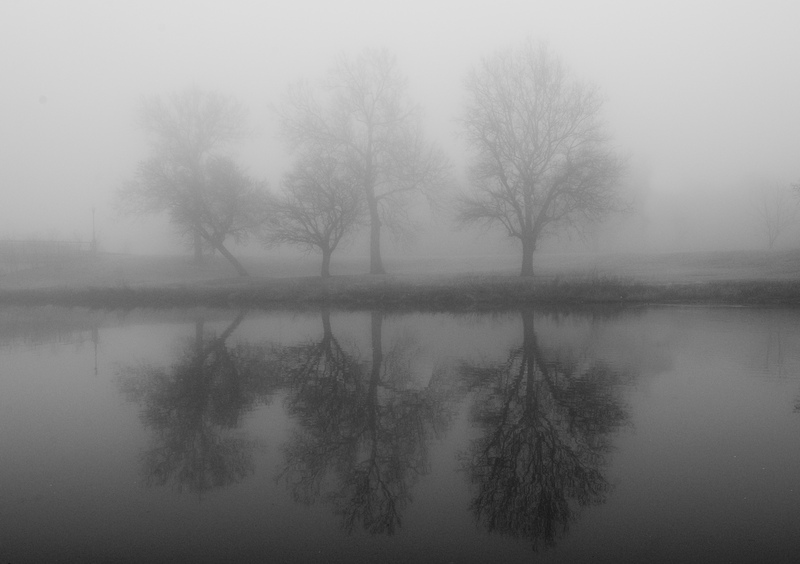 Another fundamental truth of photographing in fog is that your physical distance to the subject matter becomes very important. The closer the subject, the more details are revealed, and vice versa. No zoom lens is going to make that distant tree obscured in the fog any clearer. If you want it clearer, you’ve got to move closer. This was as much fun as I’ve ever had photographing anything. Ever. I hope it happens again soon! 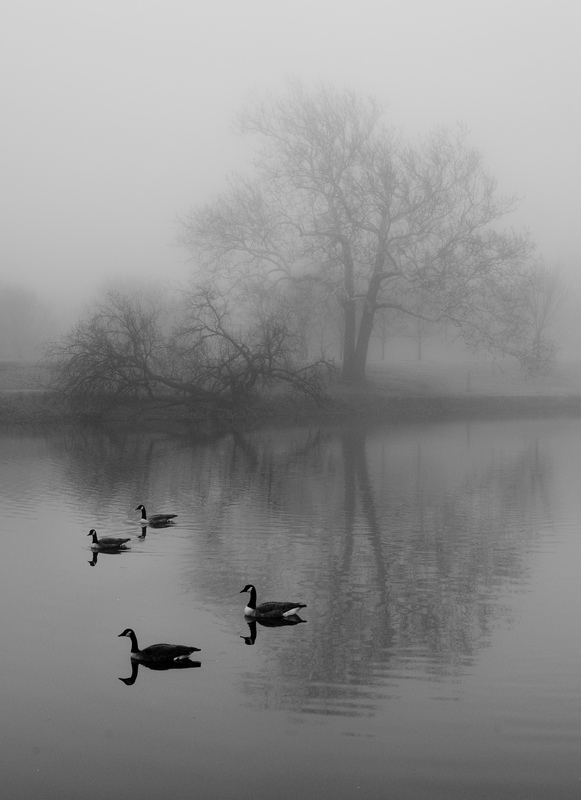 Something of a miracle happened yesterday morning in Wichita, we had another dense fog. Since it was a weekend, I was able to venture out with my ‘real’ camera and shoot with no time pressure. It was creatively rewarding, but it was also just plain fun. Wichita sits at the confluence of the Big and Little Arkansas rivers, which under the right circumstances can provide a nice foreground water refection. I shot, and shot, until I couldn’t shoot anymore. Instead of burning off into sunlight, this fog hung on a long time and was followed by thunderstorms. 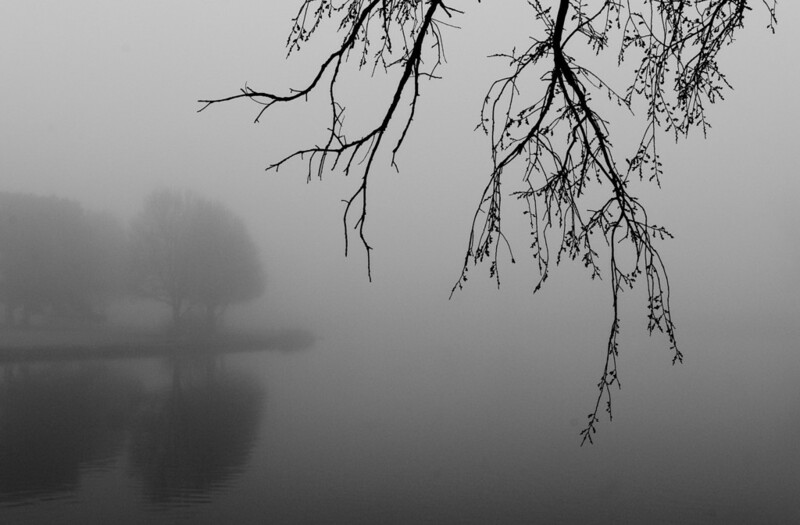 I am hereby designating this as ‘ fog week’ at the Warped Prism, at the end of which anybody who is reading this will probably be tired of bare trees in the fog. We’re blanketed in snow here in south central Kansas, and are just coming off one of the coldest nights ever recorded here, -17 degrees F. Yes, there’s a minus sign in front of that 17. 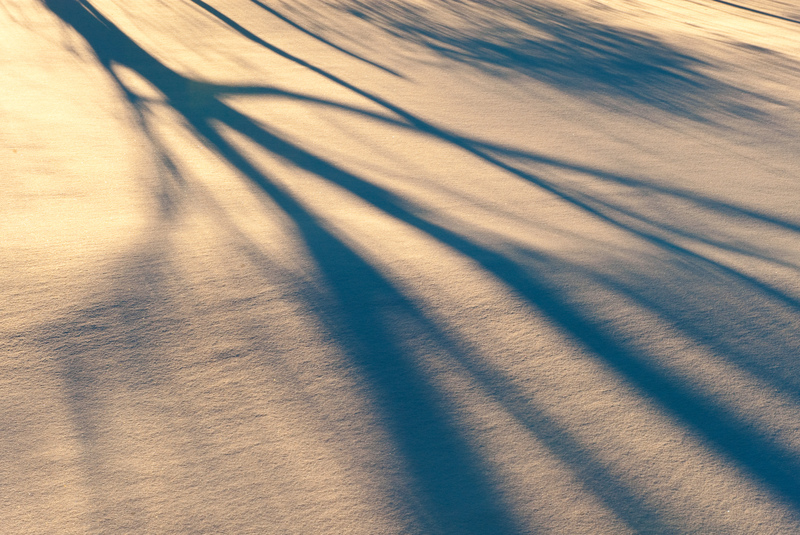 Anyhow, I took a quick walk around the yard and found the tree shadows on the snow more interesting than anything. The sun was getting low in the sky and the light turning a little warm. It almost looks like I was panning the camera, but you can see the snow is sharp. Icy Morning Fog In The Trees-Chulitna River Valley Alaska. This was the same morning I was able to get my favorite image of Mt. McKinley (Denali). This is looking down into the trees in the river valley below the Princess McKinley Wilderness Lodge. There was a fog in the valley that was beginning to burn off. I doubt I did it justice, being obsessed with the mountain left little time for what would otherwise have been my primary focus. One of those ‘just too much to process’ situations. Princess was in the process of building a wooden fence which would block this view, a few more steps forward and there would have been no more photographer-a pretty dangerous spot with an unprotected shear drop off. This was on the grounds of the lodge so I can see their point.